HUGE congrats go out to our friends Lynn and Michael. 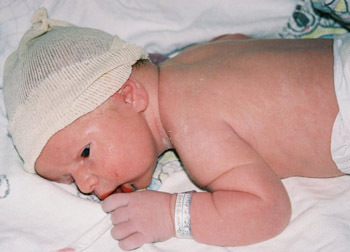 Lynn gave birth to Michael Jr. on his daddy's birthday, July 23, 2003, at 4:49 p.m. CST. The baby weighed 7.9 lbs. and was 19.5" long. He has strawberry blonde curls and blue eyes, and is just about the most adorable thing we've ever seen. We met Lynn and Michael in 1996 when we were both planning our weddings. We attended their wedding in Disney World a year later, and even vacationed with them in Disney a few years back. We've always remained extremely close through cross-country moves and life in general. We couldn't be more happy -- or more thrilled -- to welcome little Michael into the world! Congratulations to mommy, daddy, and brand new son! ...God made Key Lime Pie at Publix. And it was good. For even more blog reads, go here. Last but certainly not least, don't forget the Blogathon begins this weekend on July 26th! Here's a question for the ladies...if your man cheated on you, would you truly enjoy looking at / wearing "make-up" jewelry purchased so soon after? I don't care if the rock is $4 mil. Every time I looked at the damn thing I would be angry and hurt all over again, reliving the exact reason(s) it was sitting there on my finger. In fact, I don't even think I could wear it, to be honest. It would be too painful a reminder. Am I alone in feeling this way? Dress #3 (the taupe/champagne colored number) was the audience choice for the bridesmaids' dresses on "Today Throws a Wedding". This week it's time to select the invitations. I ended up going with choice #2 because of it matching the dresses selected last week. Which ones did you pick? And last but not least, another new advertiser for WM! - Fiji's Maravu Plantation. I'm behind on pimping these...but here are the July 2003 "Fifteen Minutes of Fame" wedding feature and "Dress of the Month". So I just wrote Dave Letterman's CBS Mailbag for the first time ever. Inquiring minds wanna know... What gives with the dark suits, dark loafers, and (always) white socks? These are the little things that keep me awake at night. WM! has a new advertiser -- the Hillcrest Guest House in St. John, U.S. Virgin Islands. Please check them out if you are so inclined. "And God populated the Earth with broccoli and cauliflower and spinach, green and yellow vegetables of all kinds, so Man would live a long and healthy life. So where has everyone else been all this time? Viva la Revolución! UPDATE from Kitty: MSNBC is in on the action now, too! Do we not set sail on the ship of fools?